Given the nature of some of the responses I get to my reports of bad driving I have prepared the following note to go with all future submissions which I hope will be heeded by the police and CPS who determine what action to take. My default riding position is ‘primary’ which is the middle of the lane that is the nearest lane to the nearside which is suitable for my direction of travel. However I will ride further to the left in the ‘secondary’ position in order to assist following traffic if, but only if, my own safety is not thereby impaired. The secondary position is just to the left of the nearside wheels of the flow of four wheeled traffic. I avoid riding ‘in the gutter’ i.e. within 0.5 metre of the edge of the road. When encountering a queue of traffic ahead I will use my judgment as to whether to wait in the queue (in primary position) or to overtake the queue (usually on the offside if there is room). This too is in accordance with my training and the national standards. I will use cycling specific infrastructure if it has an advantage in terms of safety or convenience over the main lanes. Cycle Routes and Other Facilities. Use cycle routes, advanced stop lines, cycle boxes and toucan crossings unless at the time it is unsafe to do so. Use of these facilities is not compulsory and will depend on your experience and skills, but they can make your journey safer." · give motorcyclists, cyclists and horse riders at least as much room as you would when overtaking a car (see Rules 211 to 215). Rule 163: Give vulnerable road users at least as much space as you would a car"
Any ambiguity in ‘as much space as you would give a car’ is resolved by the clear illustration accompanying rule 163. 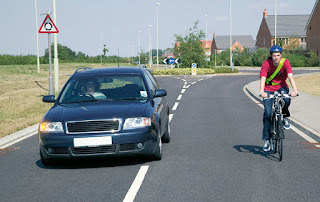 2.5.1 Cyclists often feel uncomfortable when cars overtake, particularly if they do so at high speed. Research from the Netherlands (CROW, 2003) shows that motorists driving at 20 mph will often pass cyclists leaving a clearance of only 0.85 metres. 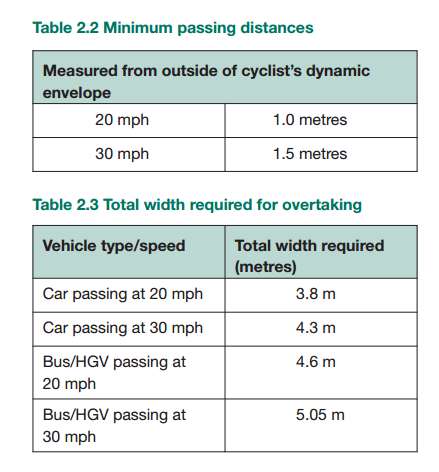 This distance increases to around 1.05 metres when passing at 30 mph. 2.5.2 These clearances are not necessarily sufficient for comfort and have been increased to establish the minimum suggested passing distances in Table 2.2. Even these clearances will be uncomfortable for some cyclists and should be exceeded where possible. Obviously the minimum passing distance increases further with increased speed If the speed is well above 30 mph then the passing distance should be well over 1.5 metres outside the dynamic envelope. It follows that unless the lane is exceptionally wide the motorist cannot safely pass within the same lane and should be using the adjacent lane (if clear) or wait behind for a better overtaking opportunity. 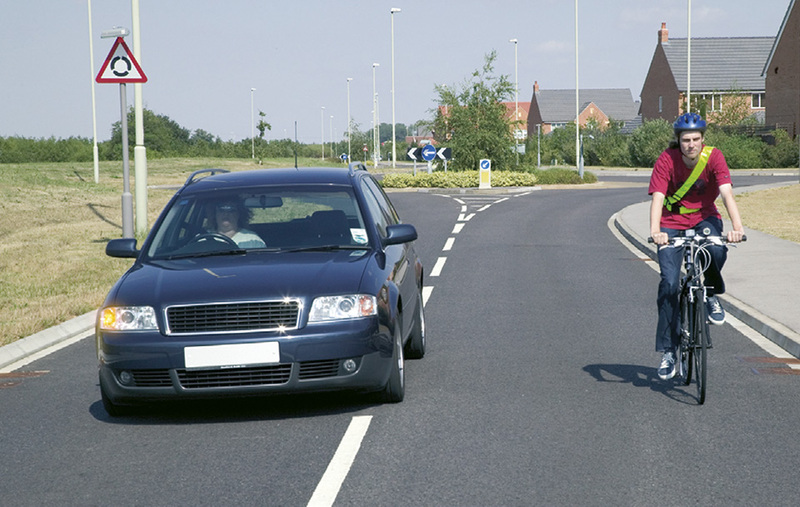 The correct decision is encouraged by the cyclist ‘taking the lane’ in primary position. A PDF of that would be useful! As above a PDF please. Would it be possible to give some advice on reporting incidents to the Police. How do you do that? What is the procedure that follows? What about video evidence; how should it be presented? Well, I would say that *a* decision is encouraged. But good luck with that. Not riding in the gutter...not withing 0.5metres of the edge of the road. Does this mean your wheel or your elbow is at least 0.5metres from the edge of the road? A very good question given the width of a cyclist. 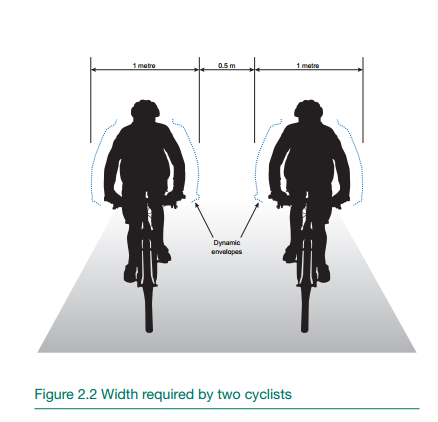 Personally I avoid secondary position if that puts my dynamic envelope within 0.5m of the edge, so 1m to wheel. If the road is too narrow to allow that I stick to primary. I will use that 1m space at the edge in an emergency such as a close pass. If there is a narrow cycle lane I will ride as though it were not there, so only fully within it if it is >1.5m wide. That's what I do too...I'm arranging some Level 3 bikeability training - so intend on learning more ASAP.